I was away at camp this weekend. Well, not exactly camp, but a crafting retreat- in Langley, WA. Langley is a really neat little laid-back place down on the south end of Whidbey Island. And this time of year it is really gorgeous with the lilacs, dogwoods and wisteria blooming everywhere you look. Sorry, I didn’t really think to get any pictures of all that stuff. But they also have Shetlands down there! That’s Butterscotch. She’s the love-bug of the flock. Comes up for scratches and digs in your pocket for alfalfa pellets. Very sweet sheep. The other girls were a little more suspicious and standoff-ish. Was a great way to spend some of Saturday morning! Then I spend a good part of the day finishing up the gradient sweater. Here it is posing in the nice little park area where I’d planted myself to work in the sunshine. Will have more pics later once I do the finishing. 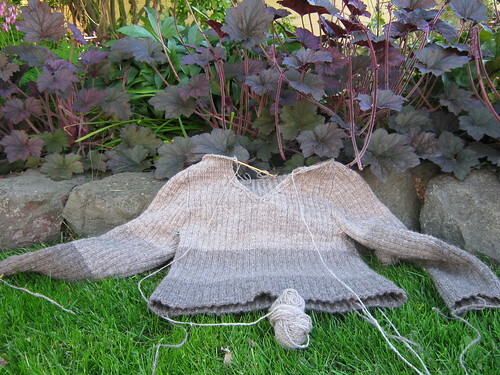 Still have a little edging to do on the neckline, and then tucking the ends in. Ps. 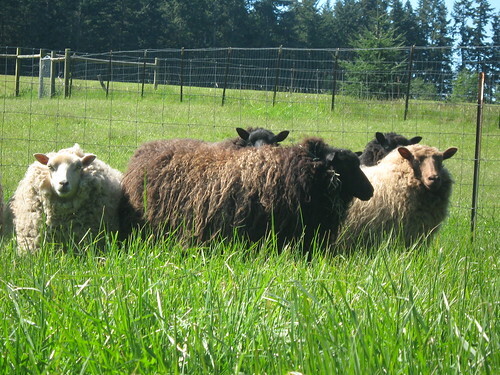 Also picked out a few more lambs on my way down to Whidbey Island on Friday afternoon! They are currently known as Homer, Bart and Bo at Schoonover Farm. Not sure if the names will stick,, but I’m awfully excited about the little guys! You live in such a beautiful area Denise. I luv the west coast! Your sweater is looking marvelous with all those natural earthy colours…I am totally into that. How fun to pick out your colours (I mean sheep)!! Thanks. I do love it out here. So green. And I’m with you on the earthy colors- natural sheepy colors- they go with everything! It looks like you had a great time and wonderful weather. Thanks for the honorable mention. 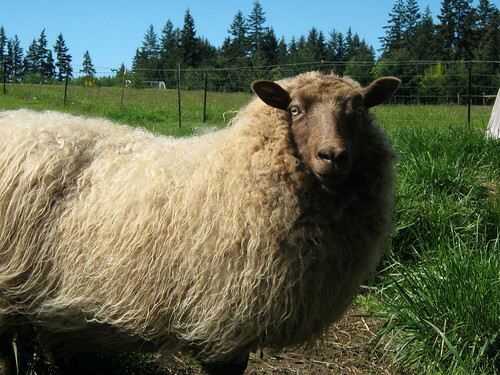 It is a thrill to have you want to purchase sheep from us. And you are welcome to change the names. Donna- I realized after I left that I should have gotten some pictures of the little guys for the blog, but it was too late. Would it be ok if I came over again maybe this weekend or later on, whenever works for you, and snaps some baby photos so the boys can have there own dedicated post? And thanks for the award- I’ll make sure to pass it on! I thought about that afterwards too. I took new photos of them today I could send you. You sure can come over. I have my spinning class all weekend so won’t be home until the evenings. Otherwise Tom may be around to host the photo shoot.